According to data from the NYPD (New York Police Department), there has been less crime in New York city in the previous 12 years -- unless you're the owner of an iOS Device like the iPhone or iPad. Grand Larcenies involving thieves stealing cell phones and electronics have remained relatively stable, especially for Apple products. 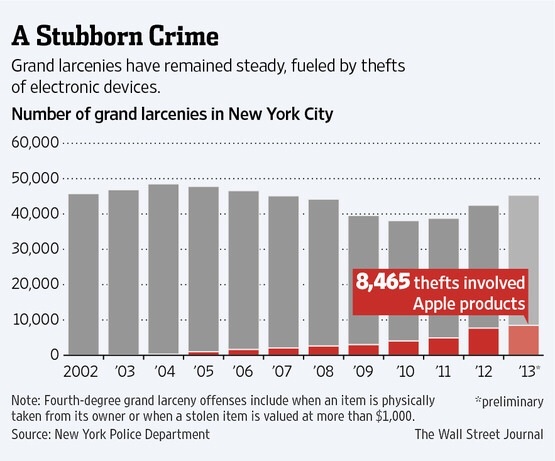 In the year 2013 alone, 8,465 thefts involved an Apple product, making up for nearly a fifth of all grand larcenies in the city. A spokeswoman for the current NYPD administration, under Commissioner William Bratton, attributed the trend to the theft of electronic devices—and noted that grand larceny arrests have increased 13% comparing 2012 to 2013. A spokesman the mayor's office referred questions to the NYPD. Apple and other electronics are often targeted because thieves want the "latest and greatest" technology as much as the next person, experts said. "You'd have a spike in crime when some new thing came along: Michael Jordan sneakers or leather jackets…Walkmans, a new technology," said Eugene O'Donnell, a former NYPD officer who lectures at John Jay College of Criminal Justice. "Just about everybody now has a hand-held mobile device that can be taken." A spokeswoman for the company said Apple has "led the industry in helping customers protect their lost or stolen devices" since it launched its "Find My iPhone" app in 2009, which allows users to track a stolen phone and erase personal data remotely.